Last Friday, I had the good fortune to hear the 94 year old Selma van der Perre speak about her experiences as a Jewish woman during the Holocaust and a survivor of Ravensbruck Concentration Camp. I braced myself for difficult stories and a somber afternoon, but what appeared on stage was an absolute spitfire of a woman who radiated hope, energy, and life abundant. I fell in love with Selma the minute she walked on stage–with a cane and on the arm of a younger person, wearing a neat suit, chic French scarf, and white beret. She was chic, sharp, and a delight in every way. Some of the stories she had to tell made your blood run cold and your stomach clench into a knot, but everything about her being shone bright and radiated hope. 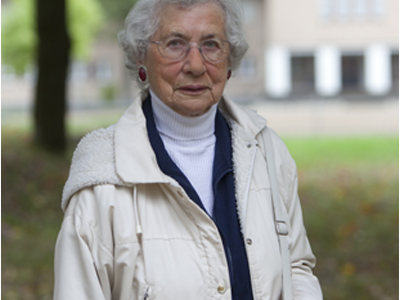 She was a young woman growing up in the Netherlands when the Nazis came to power. Her family was pulled apart, her father died in Auschwitz, and she became a courier with the Dutch resistance, taking a false identity and dodging the authorities while helping the cause. Eventually, she was caught and sent to prison, then transferred to Ravensbruck. Selma could, and eagerly would, tell you stories all day about those years–each story more fascinating than the last, and many of them heart-wrenching. They are her stories to tell, and I couldn’t do them justice, so I won’t try to re-present them here. 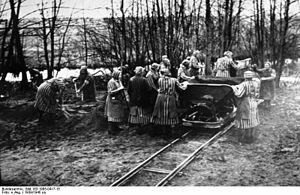 You may use this link to hear her tell some of her stories in her own words (from a BBC program on Ravensbruck– “Surviving Ravensbruck”). I promise you that it is well worth your time. Even as a factory worker in Ravensbruck work camp, she and her colleagues would sabotage the gas masks they manufactured for the Third Reich, not screwing them together properly. Anything they could do to undermine their captors, they did. And they showed each other kindness–she was adamant that kindness from other inmates (and even a prison guard early on–a guard who was later incarcerated and killed for her part in helping inmates) kept her going during tenuous times. There are very few survivors of the concentration camps still around, and, like Selma, they have reached a ripe age. It is so important that we hear their stories whenever and wherever we get the chance. I very nearly missed hearing her talk. I had a busy day Friday and her talk wasn’t at a convenient time for me . . . and, as you can imagine, I felt a little discomfort about going. 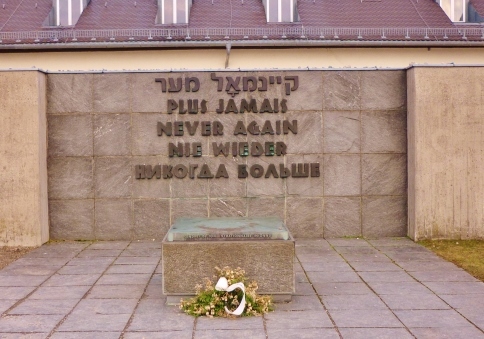 It was a beautiful, sunny Friday afternoon, and the Holocaust is a heavy, horrific topic which anyone might, understandably, want to avoid. But that would have been a mistake. When I left the theater and stepped back into the bright afternoon, I was uplifted. The horror of the history had been laid out unquestionably in her talk–I flinched time and again as she told stories– but, I tell you this, the lesson was transformed in the person of Selma van der Perre. “This cannot happen again,” she said, “we must be very aware of such things going on still in our world.” Her message was clear and serious, but in her capable hands it was uplifting and resilient. Our lights should all shine so bright. Thank you, Selma van der Perre. Ah, Cambridge. Two weeks ago, I was there. 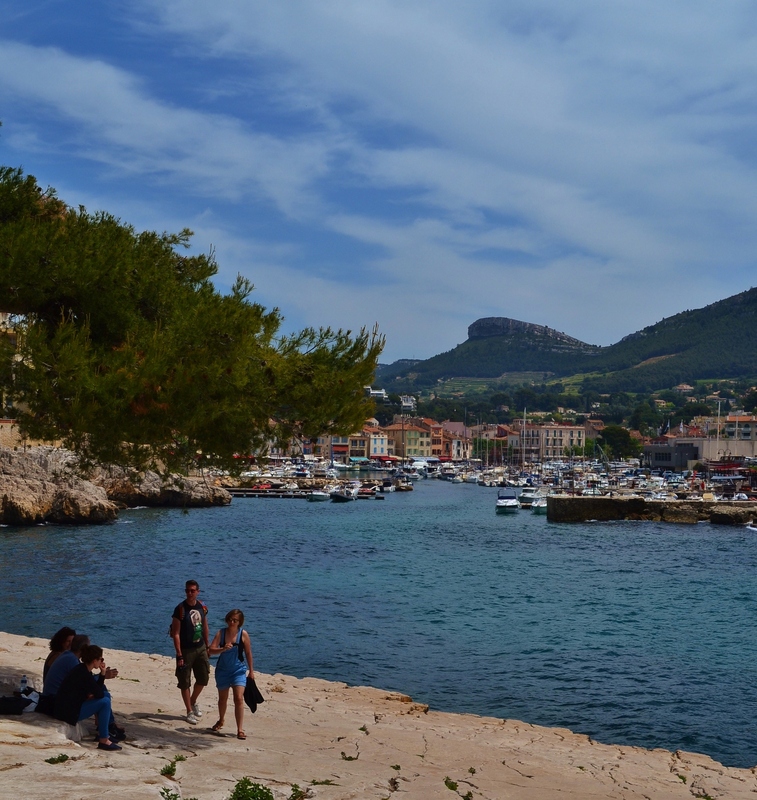 This week, I wish I was still there. A few days ago, my corner of Germany was a mess. Rain/snow/hail falling in scissor patterns (like the wind was blowing two directions at once), followed by a more languid thunder storm (minus the storm, because at that point the precipitation mostly left and only the thunder came swaggering through). It was absolutely infuriating weather to have at the end of April. . . and with the pollen full out and everyone’s eyes swollen to the size of grapefruits. Mother Nature is beating us senseless here! So I’m meditating this week to keep my wits about me. 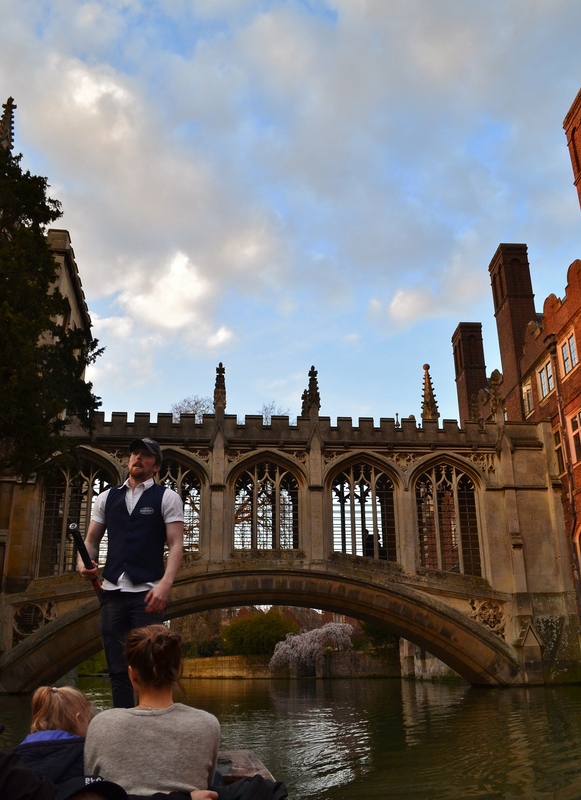 I’m closing my itchy eyes and thinking back to the bright evening we spent punting on the Cam in Cambridge, when the world was beautiful and spring was a given. 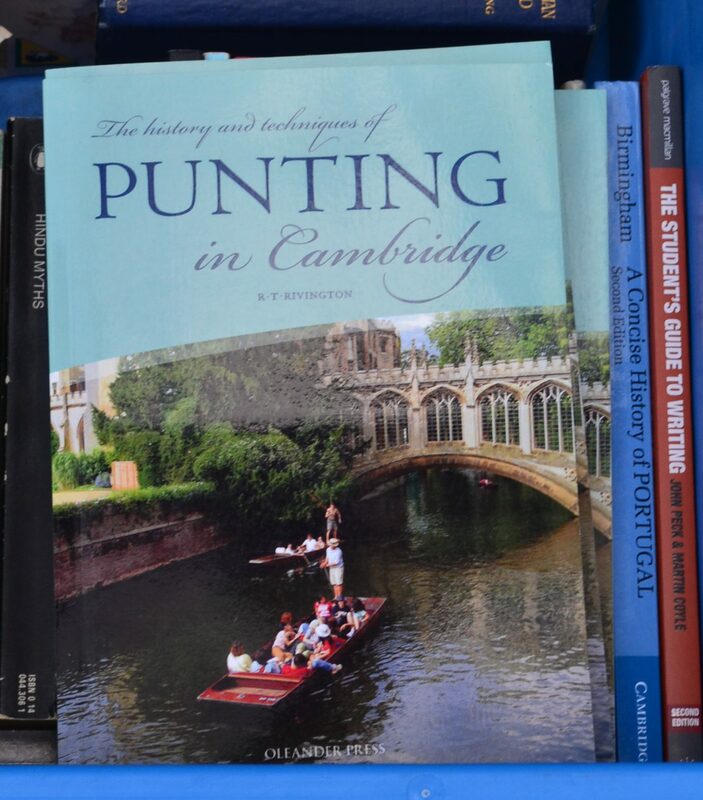 If “punting on the Cam” is a phrase that leaves you scratching your head, not to worry. It has that effect on many people. The Cam is the river that runs through Cambridge, and punt boats are traditional flat bottomed (square and stodgy looking) boats. The “punter” is the unlucky bloke who stands at the back of the boat and both steers and propels the small vessel with a long pole. It looks easy enough, but I’m told it’s a little tricky and tiring for beginners. 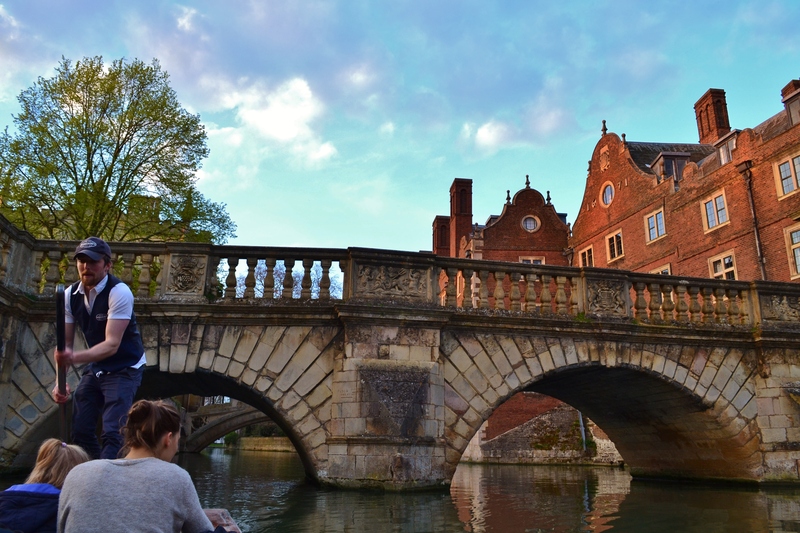 Conventional wisdom in Cambridge: if you live there, take the time to learn to punt and then enjoy self-hire boats at your liesure; if you’re a tourist, pay the boatman and enjoy the ride. 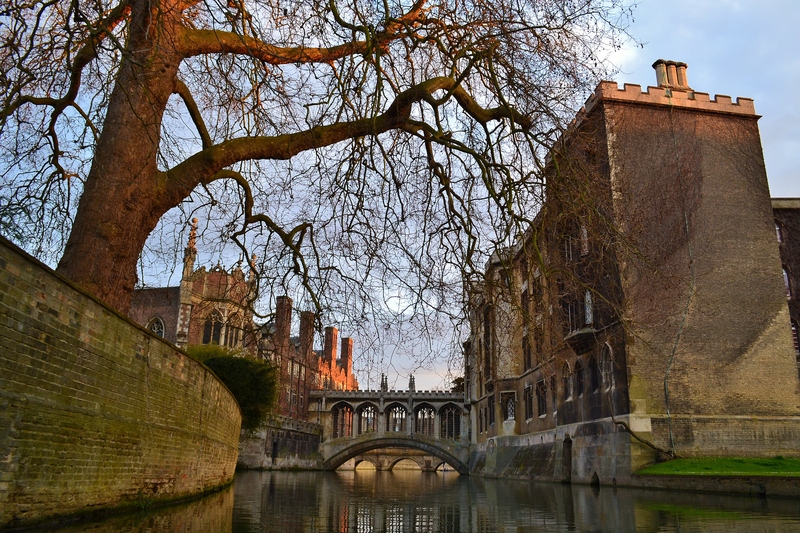 Most of the punting guides will offer their “puntees” a bit of history and Cambridge trivia along with the beautiful ride. 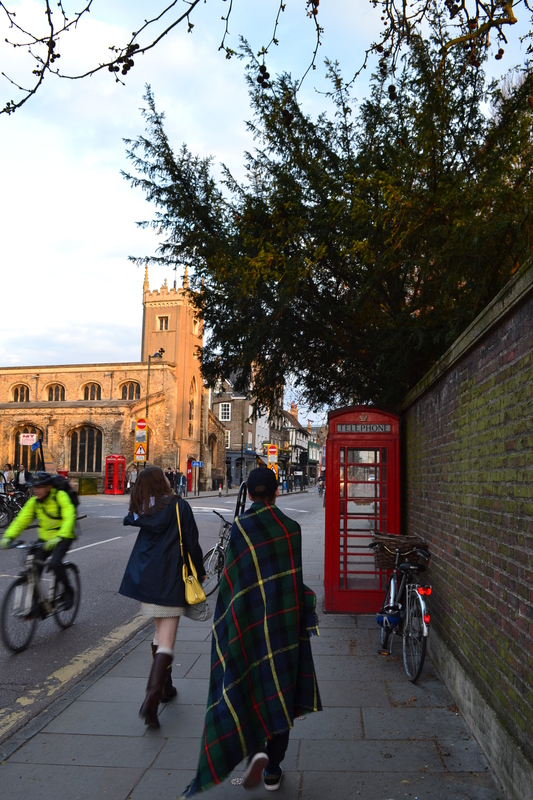 Church spires, red phone booths, and tartan blankets– very British. 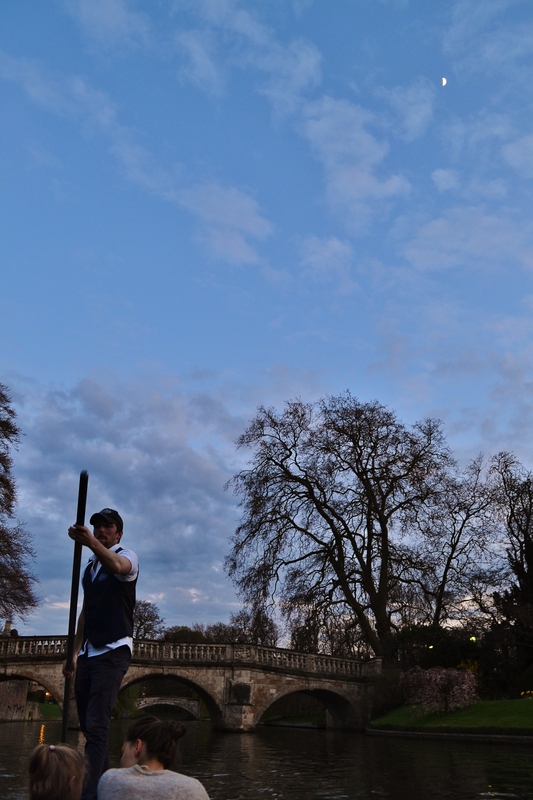 We did our punting in the early evening. It was still bright, but it was a weeknight and campus was mostly quiet along the backs by the river. The air was growing crisp, to the point that our punter had to lend my son a blanket while we strolled around the block and waited for him to prepare our boat. 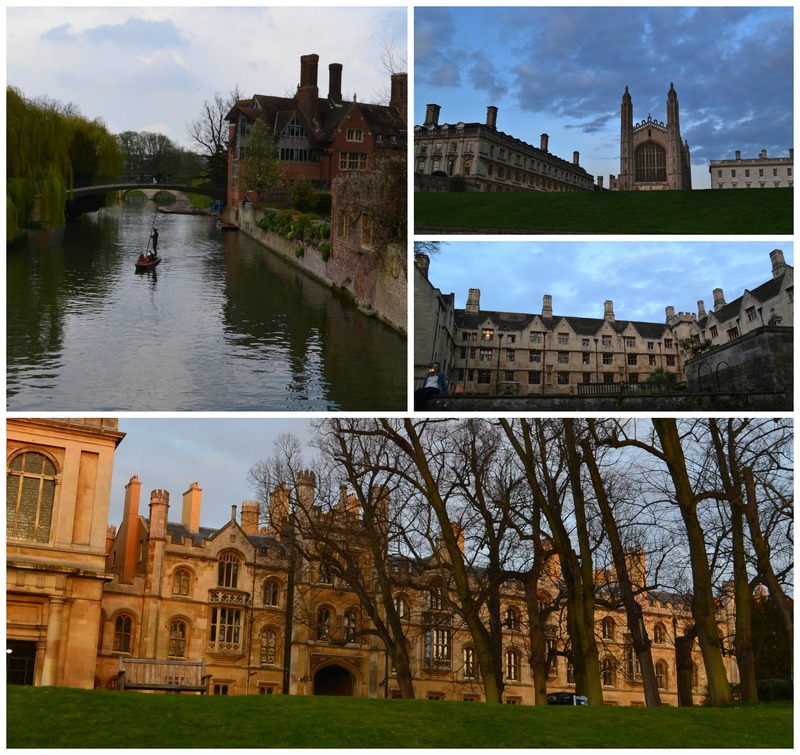 Cambridge University is made up of 31 colleges, many of which have backs along the River Cam. 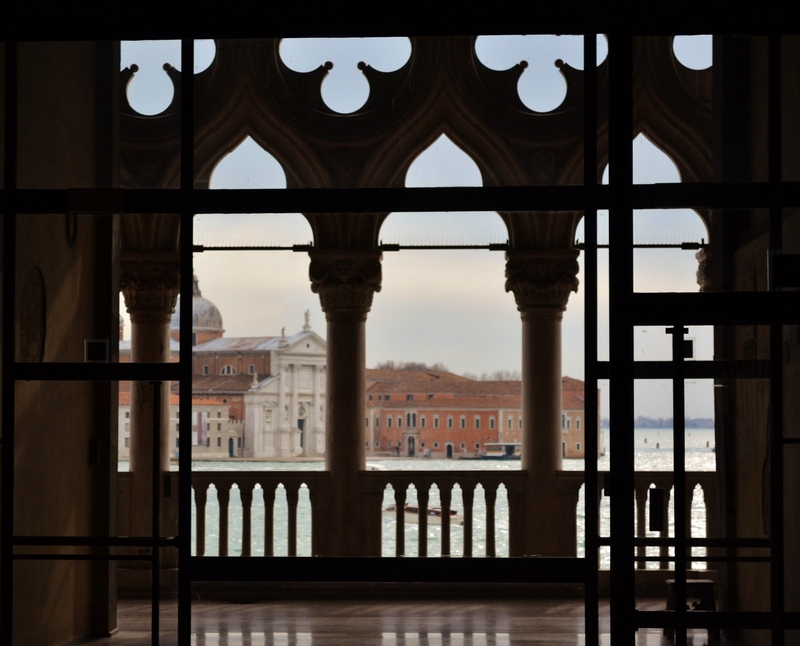 Each college has its own architectural character, and even modern buildings (usually dormatories) occasionally pop up next to Tudor arches and ruddy red brick. Our punt ride lasted just under an hour, and that was perfect– no time to get fidgety, plenty of time to be lulled into a serene trance on the tranquil river, to soak up a little history, to nibble at the edges of tales of Kings, Queens, scholars, actors, and socialites. As the sun began to fall over Cambridge and a sliver of moon showed itself in the sky, our punt, having come to the halfway point of our journey, turned itself around and we retraced our steps. This slow boat ride home offered us the chance to see the backs once again, from another angle, in another light. . . it seemed fitting in a place like this, where so much history has turned and turned again, and the water keeps dreamily floating its passengers on by.